As the people of Sri Lanka grapple with the rising cost of everyday living, the country's huge army has started buying up vegetables from producers. It is then selling them on at fixed prices lower than current shop prices. The army, which no longer has a war to fight, says it is doing its bit to ease people's lives in peacetime. 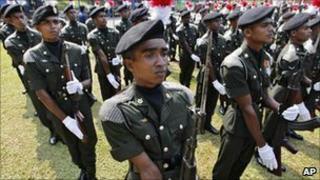 The military has been moving into new areas of life in Sri Lanka - it recently opened a tourist resort in the north of the country. A military spokesman told the BBC that the army is buying up vegetables from farmers. It is bringing them to the Colombo area to sell them at concessionary rates - about one third less than the shop price. He said the army would bear most of the transport costs and that it was a better deal for both producers and hard-pressed consumers. The move is of several unusual recent measures taken to tackle food price rises and shortages. Eggs and chickens have been imported on a huge scale. Coconuts were also to be brought in, but the idea has been suspended because of quarantine regulations linked to palm diseases. Economists say the price hikes are worsened by Sri Lanka's protectionist food policies, meaning there are usually high tariffs on food imports. And some question whether the army's vegetable sales can work. One business analyst said that prices should be allowed to fluctuate so that farmers can invest their profits in increased production. The impact on ordinary greengrocers and vegetable sellers is also unpredictable. But the army says it will continue selling vegetables until prices stabilise.